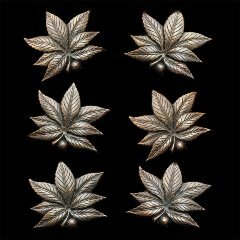 Description: The Chestnut Leaf Family consists of six different chestnut leaves rendered at realistic scale and with incredible detail. Material and finish: Aluminum or silicone bronze (as shown). Clear anodize coating for aluminum pieces; brown patina for bronze pieces. Anchoring: Parts are anchored with two blind Smart Pins affixed with two-part epoxy. Product Spacing: 18” from end of planters/walls and approximately 36” on centers. Do not apply at grout joints. Available in aluminum (prices listed below) or bronze (please Contact Us for pricing on bronze pieces). * Kits include parts, anchors, and epoxy adhesive. Each order will contain masonry drill bits, drive keys and hole brushes sufficient to install quantity of pieces ordered. Orders of 100 pieces or more will require purchase of dual-cartridge epoxy applicator. Orders of 250 pieces will include a free epoxy applicator. Freight and sales tax (for delivery to California only) are not included in price. To order or to obtain additional information, please Contact Us.